VIPER is complex, scary, and well - different. There’s a hint of venom beneath the surface of VIPER and it can hurt. Yet, over time the pain subsides, and it becomes one of the cures to structuring your code. Bye bye venom. Hello happiness. 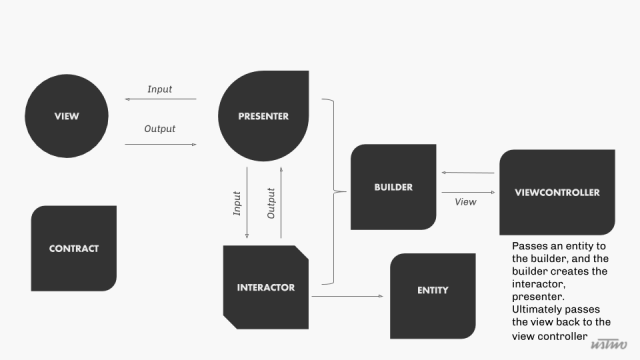 As a developer I would like to use the VIPER design pattern to build reusable modules. 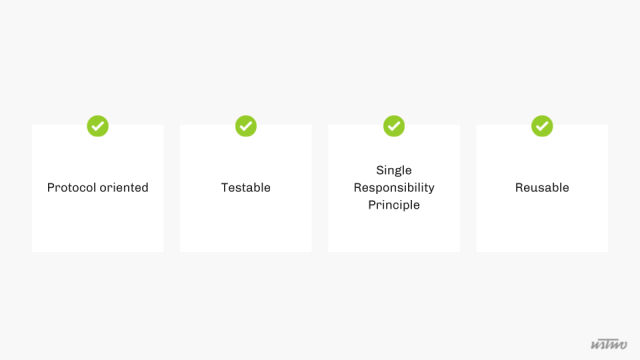 We wrote this post hoping that it empowers you to evaluate whether or not VIPER is the right option for your project or framework. 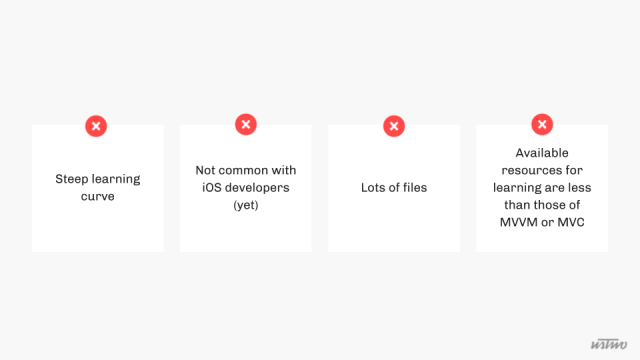 A few folks over at Mutual Mobile wanted to improve their testing coverage on their iOS apps. As a result, they came up with the pattern itself. More in regards to where it came from can be found here. Literally speaking, Viper is a backronym standing for View, Interactor, Presenter, Entity, Router. VIPER becomes more like IREPV… That is a word to someone, somewhere. 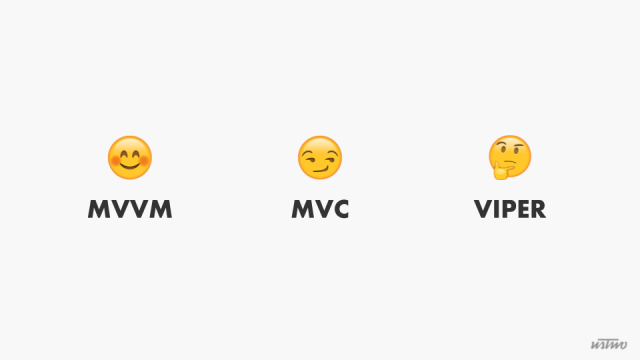 We validated the hypothesis of using VIPER in a reusable module by building a framework. The framework is focused on playing video content. Playing video involves UI updates, data downloading & data synchronization. These interactions proved that a video playback module would be a worthwhile candidate for a VIPER structured module. VIPER modules are protocol-oriented. Every function, property, input, and output is implemented via a protocol. We also wanted developers of this framework to have an easy way to configure VIPER modules. Builder: A simple object used to configure the VIPER module and set up dependencies. It instantiates the presenter and interactor. Ultimately it returns the view to the viewcontroller. Now this is key to understanding the pattern, calming your brain down, avoiding the fall into rabbithole complexities. 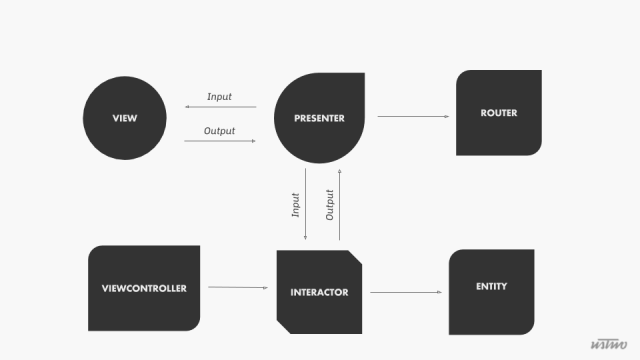 Major Lesson 1: Understand the inputs and the outputs of your module. 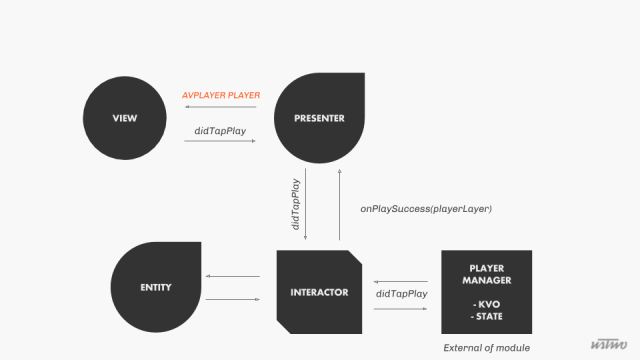 Once the view receives the AVPlayerLayer from the presenter, it can reload its interface. The Presenter holds a weak reference to the interactor. The presenter ONLY cares about the interactor’s input protocol. The forwarding of the “didTapPlay” input. The Presenter forwards the input message; however, the Presenter also depends on the interactors knowledge of the video entity data. The presenter and interactor relationship is the most important part of the data flow. The presenter conforms to the interactor’s output protocol. The Interactor uses the weak property of the presenter to pass back the output data. VIPER will shine with long term projects, applications where security and business logic are high, and when testing must be implemented. You will notice your code become cleaner. You will be able to separate features & modules amongst team members easily. When there is a UI formatting bug you will instantly know to check the Presenter class. When there is a logical bug, you know it’s stemming from the interactor. More clarity, less venom. This topic was presented at try! Swift NYC 2017. The presentation can be found here. All additional try! Swift talks can be found here.